Here's a report of the last of my Thursday day trips this month. You'll notice my destination's not further away than the rest, as intended, because my planned safari had to be postponed. Instead I've ventured barely five miles from London, to riverside Surrey. Again, hang on in for the last one. Arriving at the station gives the wrong impression, which is that Chertsey is a town brimming with dull late 20th century offices. But cross the bypass and the river and things pick up considerably. 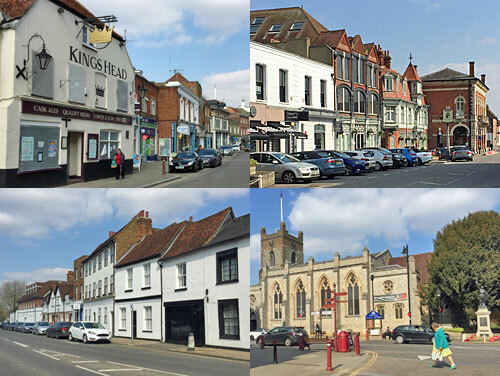 At the heart of the town are the parish church, war memorial and marketplace, from which lead off Windsor Street, London Street and Guildford Street. Chain shops do not proliferate, unless you poke through the atypical 1980s mall to uncover the enormous Sainsburys. Traffic signs include one warning of Building Overhang and another citing market regulations from 1599 as a reason why you can't park in the shaded area on Saturday mornings. 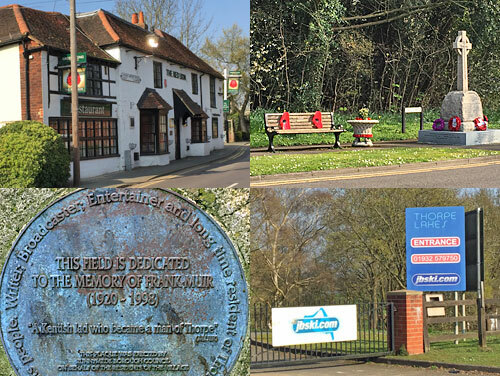 Every town has its historical 'thing', and Chertsey's is a bell. The curfew bell in the parish church tower used to ring out after dark to tell townspeople to remain in their homes... and still rings at 8pm every weekday evening (September 29th and March 25th only - staying indoors no longer mandatory). Even the local football club are nicknamed The Curfews, as I spotted on banners hoisted all over the town advertising this afternoon's FA Vase semifinal. It's such a big game, all four turnstiles will be open. 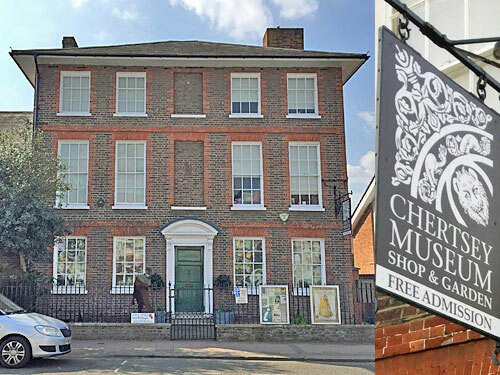 The town's museum is housed in a Georgian townhouse called The Cedars, and extends its remit to cover the entire local borough of Runnymede. You can guess what one of the displays must be about. The museum's free to enter and spread over three floors, as the nice lady will tell you, although the top floor is limited to a couple of maps and a landing with some clocks. The most interesting gallery showcases the Olive Matthews Collection, a nationally significant assemblage of fashionable evening wear and formal dress from the 1700s onwards, including sparkly brocade, elaborate waistcoats, one of Queen Mary's silk tulle gowns and a roomful of accessories. The local history room doesn't quite compare, and the First World War exhibition is now a year past being obligatory. You really should visit, but half an hour tops. In the early days of Christianity in England, Chertsey was one of the big hitters. Its abbey dates back to 666 AD, intriguingly the same year as Barking's, and by the 14th century it was one of England's Big Five. Originally Chertsey was an island site, the Abbey River alongside being an artificial channel built to provide power from a watermill. King Henry VI was initially buried here following a dubious death in the Tower of London, although fairly soon reinterred in Windsor instead. 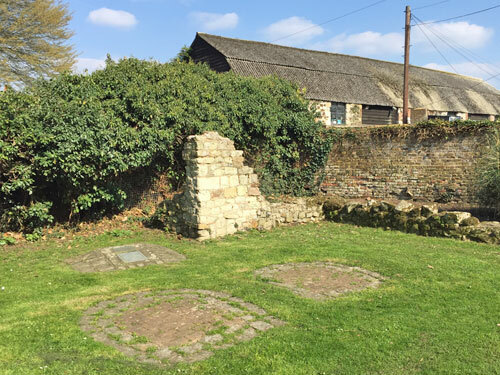 In common with many important monasteries Chertsey Abbey was levelled in the 1530s so today almost nothing remains and the site has been either built over or sealed off. One corner of Abbeyfields park contains a bit of contemporary wall, but not of the abbey itself, plus the remains of what might have been two bread ovens. Of more interest are the three huge long turfed grooves beyond the flower beds, these formerly fishponds dug in 1308. Expect to find out more about the abbey at the museum's next temporary exhibition, which I annoyingly missed by a week. 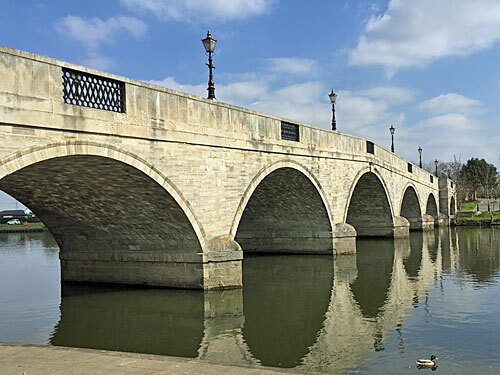 Chertsey has the only bridge across the Thames between Staines and Walton, motorways excepted. A timber bridge replaced the ferry in the 14th century, but by the 18th was wholly inadequate and the current elegant five-arched structure was built instead. Anything over 18 tonnes has to go a different way round, and the pavements are only comfortably wide enough for one abreast. The river is to be respected, so the historic town never quite spread this far for fear of flooding. Today a couple of gastropubs intrude, plus a wall of luxury apartments rolling down towards the marina. Beyond that are lush sprawling meadows, marred only by a line of pylons, and increasingly remote. The Thames Path can only be followed on the non-Chertsey side. 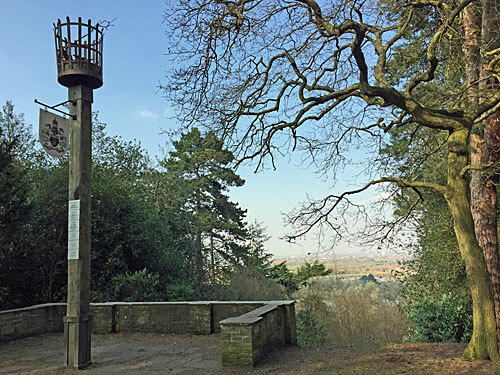 In a flat town like Chertsey, a 70m-high knoll stands out. St Ann's Hill lies a mile west of the town centre, dangerously close to the M3 which had to kink slightly to get by. It's heavily wooded, mostly with pine, and proved the ideal spot for an Iron Age hillfort, both defensively and as a lookout. If the summit now looks unexpectedly flat that's not fortifications, that's a buried reservoir dating back to the 1920s. Trees make it difficult to see much these days, but there is one official viewing slot cut through to offer a very decent view of Heathrow Airport. I only watched for a couple of minutes but during that time, ooh, they swapped runways. Alas I failed to find the Nun's Well, but I suspect most of the popular dog-walking circuits pass by. Thorpe is a small village to the northwest of Chertsey, again ultimately of 7th century vintage, and with another part-medieval church. It has its moments, including the cottages near the Red Lion and the conservation area by St Mary's, but general ambience isn't helped by the presence of a massive motorway junction at the foot of the main street. Close by is the Frank Muir Memorial Field, a tribute to the great comic and raconteur who moved to the village in the 1950s, though in truth little more than a small-park-slash-recreation ground. You cannot sit beside Thorpe's war memorial without disrespecting the enormous poppies tied to the benches. The American School in England, a large boarding establishment at the east end of the village, features a pot of tea on the school badge. And if you haven't twigged yet, somewhere much more famous is named after the place. The gravel pits between Thorpe and Surrey were flooded in the 1970s and a water-based theme resort established on the central island. Thorpe Park will be 40 years old this year, and is quite the place for plummets, whirls and scares. But turning up on the day now costs £55, which is considerably more than I paid last time, so I decided against a proper visit. Instead I noticed an unlikely public footpath called the Monks Walk which crosses the lake to the island, runs along the edge of the theme park and continues off the other side, because that's the route people walked from Thorpe to Chertsey before the land was flooded. And I followed that. The Monks Walk is a bit creepy, there being no means of escape for a full mile. It kicks off under a dual carriageway at the Chertsey end, entirely unappealingly, curves briefly then heads pretty much straight for the remainder of the route. Before long a red metal bridge crosses to the main island, and suddenly you're behind the scenes at the theme park. Through the fence is another fence, for added security, and beyond that the first of the rides... a decaying trough rising into the treetops and swooshing downwards on lofty stilts. 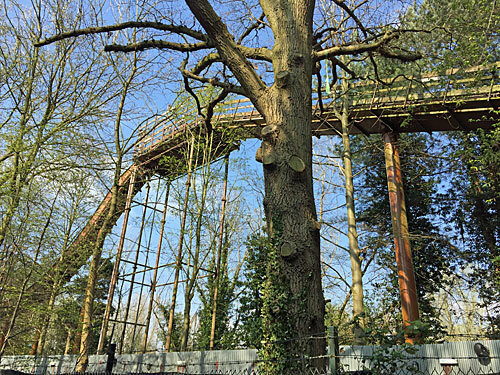 This ghost attraction is Loggers Leap, once the highest log flume in the country, and the site of Princess Diana's famous day out with the royal kids in 1993. It closed at the end of the 2015 season, was announced formally redundant last month, and now makes for a sorry sight. Continuing along the path I caught sight of the backs of refreshment kiosks, a shanty town spray-painted 'Danger Zombie Outbreak' and several unappealing storage dumps. From inside the compound came the sounds of ratcheting and rattling, matched by the occasional set of carriages visible high above plastic sheeting. 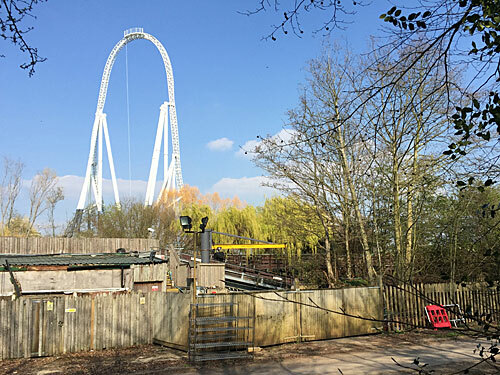 The best view came up a service road between Nemesis Inferno and Rumba Rapids, as a handful of punters shot out above a line of wastebins and a rope dangled 62 metres from the top of Stealth's narrow loop. A little further along four rubber-ringed rapid-riding capsules had been dumped, perhaps awaiting repair. The remainder of the footpath, on and off the island, runs mostly between service roads and reveals unexpectedly little. The fence facing towards the lake is occasionally broken. The fence facing Thorpe Park is always secure. I can see why they'd rather punters never saw backstage.